Isn't she zombtastic? Awesome colors and all those accurate, tiny stitches. holy crapcow! Even the eyes are creepy zombie!! I love this one! Check out this cute little feather with the neatest tiny stitching you ever saw! She did a lovely job! Thank you PaleAngelLex!! Wow, I love both of these! Oh, the feather is just PERFECT! I want! Hang on to it tightly, thisbirdabsurd! Both of these new badges are amazing!! The details in the zombie are wild!! I love the feather and would make it into a hair clip and wear it every single day . The feather is so beautifully done...good idea, Lime...I bet it would get a lot of comments if worn! 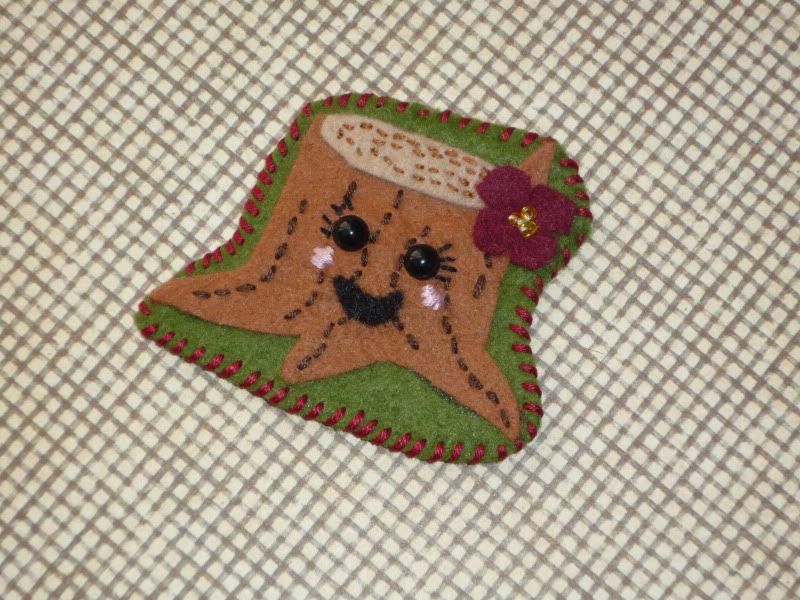 I received from QueenNinjaMonkey - the absolutely adorable Miss Stump! Isn't she wonderful? I love her! Write that down in your pirate pad. That pin-up is absolutely amazing! I'm in love with all the badges in this gallery! Next an awesome sugar skull from Batgirl, how I love all things Day of the Dead! It's hard too see but the white felt has sparkly bits in it and I'm in love with the beading, especially the flowers! Thank you both so much! I had so much fun with this swap, I can't wait to make more badges! !